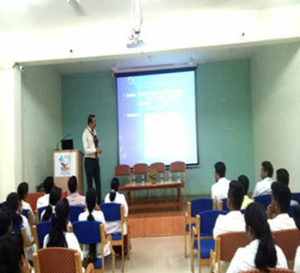 The guest lecture was conducted on “Integrated Management Of Neonatal and Childhood Illnesses” organized by department of Child Health Nursing at KAHER, Institute of Nursing Sciences, Belagavi on 12th March 2019 at 9.30 – 10.30 am . 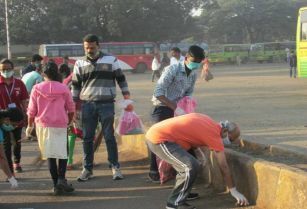 Mr.Mahantesh Sarabani Asst.Prof. Department of child health nursing, Government college nursing, BIMS, Belagavi, delivered elaborative lecture on “Integrated Management Of Neonatal and Childhood Illnesses” and explained in detail about IMNCI which helps to enhance the knowledge of participants regarding IMNCI. 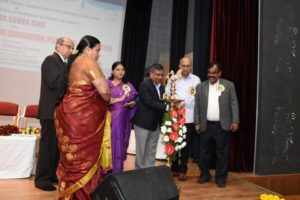 Prof (Mrs) Sumitra LA, HOD, department of Child Health Nursing welcomed the guest speaker Mr.Mahantesh Sarabani. 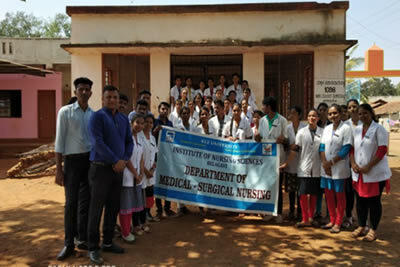 3rd year B.Sc (N) students and faculty from KAHER, Institute of Nursing Sciences Belagavi attended the guest lecture. 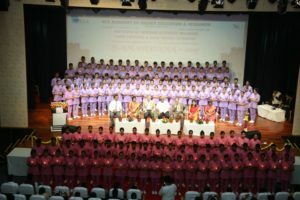 Beneficiaries: 85 students and faculty. 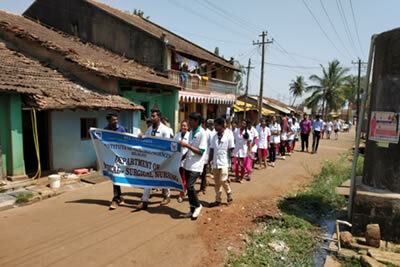 Department of Medical Surgical Nursing had organised NSS, Rally on awareness of cancer (Smoking and Tobacco Injuries to health) on 25th February 2019 in Devagiri Village, Belagavi. Faculty of Medical Surgical Nursing Department and nursing students conducted rally on smocking and Tobacco which causes lung and oral cancer, to the general public. 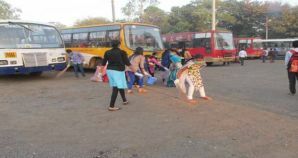 Department of Medical Surgical Nursing organised NSS, Health Awareness Program on Worm infestation on 21st February 2019 for Govt. Primary School Children Devagiri, Belagavi. 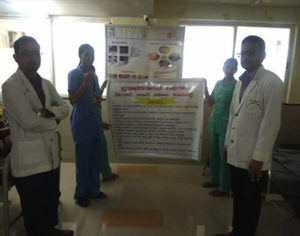 Faculty from the Medical Surgical Nursing Department had given health awareness programme on Worm infestation – Causes, Signs and Symptoms, Diagnosis and its Management, Prevention. 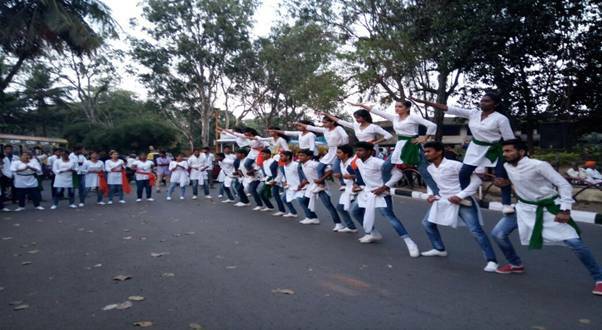 Eighty School students were benefited from the Health Awareness Program. KAHER Institute of Nursing Sciences, Department of OBG Nursing, conducted Health Awareness Programme on prevention of Breast and Cervical Cancer at Vantamuri, Belagavi on 12th February 2019. 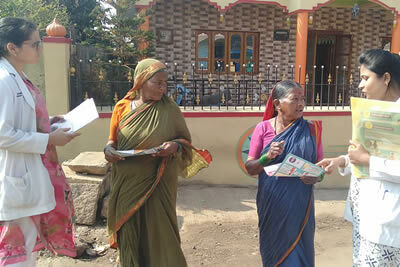 Distributed the pamphlets to all women in reproductive age followed by explanation about the causes, warning signs &amp; symptoms, importance of regular screening, regular health checkup and prevention of Breast Cancer and Cervical Cancer. OBG Nursing staffs and OBG (N) PG Students were involved in the programme. 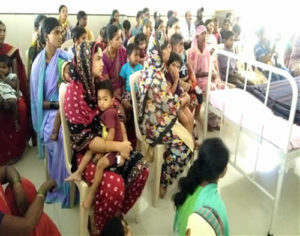 Total 104 women in reproductive age were the beneficiaries. 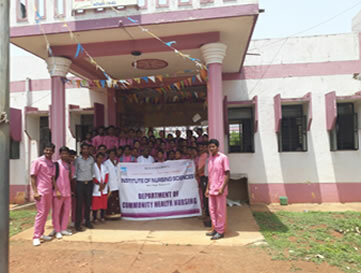 KAHER Institute of Nursing Sciences, Belagavi, Department of OBG Nursing conducted Health Awareness Programme on “MENSTRUAL HYGIENE“ as a part of NSS activity at Government school for Deaf Children, Vidyagiri, Belagavi on 25.01.2019 from 9 :30 onwards. 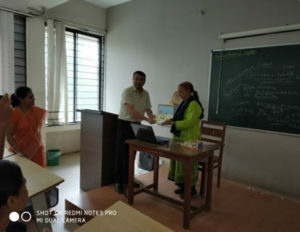 Lecture was delivered by Mrs. Uma Kole Assistant Professor INS KAHER, along with PG students with the help of school teacher Mrs. Shilpa with sign language. 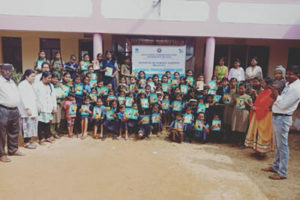 Health education was delivered regarding menstrual cycle, pre-menstrual symptoms and their management followed by distribution of crayons, pens and books for special children. 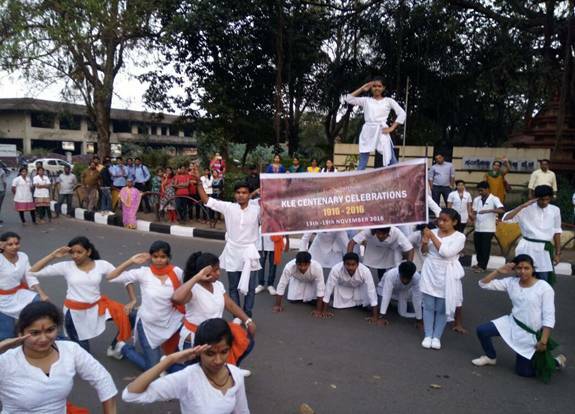 78 children’s from Government School for Deaf were the benefeciaries. 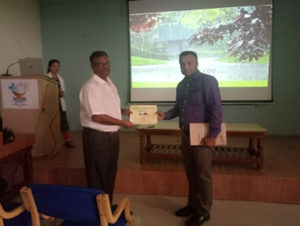 The guest lecture was conducted on “Management of cleft lip and cleft palate” organized by department of Child Health Nursing at KAHER, Institute of Nursing Sciences, Belagavi on 28th September 2018 Dr. Rajesh Powar Professor & Head, Department of Plastic & Reconstructive Surgery delivered elaborative lecture on “Management of cleft lip and cleft palate” and explained in detail about cleft lip & cleft palate, which helps to enhance the knowledge of participants regarding cleft lip & cleft palate. 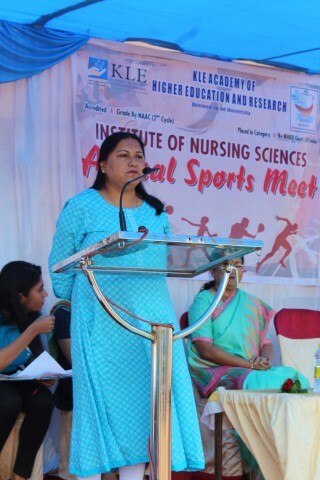 Prof (Mrs) Sumitra LA, HOD, department of Child Health Nursing welcomed the guest speaker Dr. Rajesh Powar. 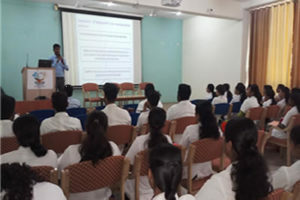 M.Sc (N) 1st & 2nd year, B.Sc (N) 3rd year, P B.BSc(N) 1st year, GNM 2nd year students and faculty from department of Child Health Nursing KAHER, Institute of Nursing Sciences Belagavi attended the guest lecture. 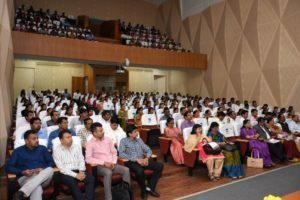 Department of Medical Surgical Nursing, KAHER Institute of Nursing Sciences, Belagavi Organized Guest Lecture on “Immunodeficiency disorders” on 21st September 2018. 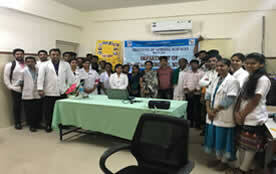 The guest speaker was Dr.Vinoda, Senior Medical Officer (ART – Center) BIMS, Belagavi. Guest speaker gave a lecture on AIDS (HIV) Incidence, prevalence and Mode of transmission and diagnostic test, Treatment modalities and preventive measures from HIV aids and B. Sc. Nursing – 2nd year, students and all the faculties of Medical Surgical Nursing department were present during the guest lecture. Department of Medical Surgical Nursing organized Health Awareness Program on prevention of Cancer on 27th August 2018 in KLE Cancer hospital Belagavi. Faculty from the Medical Surgical Nursing department and 3rd year B.Sc. 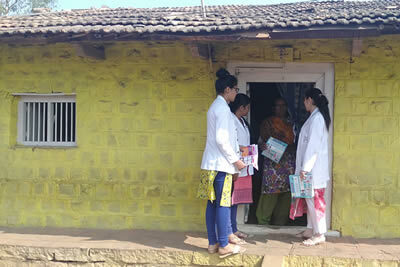 Nursing students gave health awareness programme on prevention of Cancer & Home care management of Cancer patients – Regarding causes, signs and symptoms, diagnosis and its management. 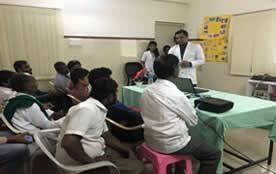 Total Fifty patients & care takers were benefited from the Awareness Program. World “Breast Feeding Week” with the theme “Foundation of Life” was celebrated on 7th of August 2018 at Paediatric ward (KMC) of KLE’S Dr. Prabhakar Kore Charitable Hospital Belgaum, organized by Department of Child Health Nursing, KAHER Institute of Nursing Sciences Belagavi. Prof Sumitra L A HOD, Department of Child Health Nursing explained in detail about the concept of World “Breast Feeding Week” celebration and emphasize the importance of Breast Feeding, its advantages and importance of exclusive Breast feeding in order to reduce child mortality and morbidity. 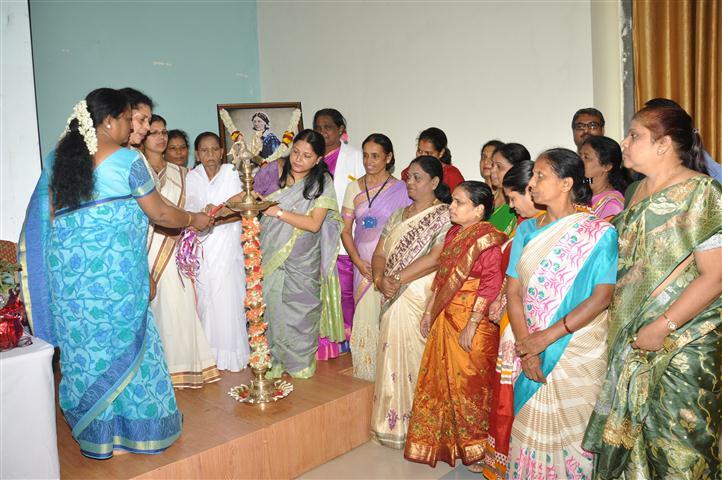 Around 50 postnatal mothers were present for the function, Prof Sumitra L A. HOD and faculty, Department of Child Health Nursing, KAHER Institute of Nursing Sciences Belagavi. Incharge of Pediatric ward (KMC), KLE’S Dr. Prabhakar Kore Charitable Hospital Belagavi. 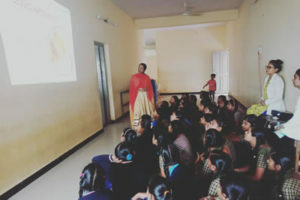 Health education on breast feeding techniques and its advantages were given by Nursing Staff and Teaching Faculty of KAHER Institute of Nursing Sciences Belagavi. Dept. 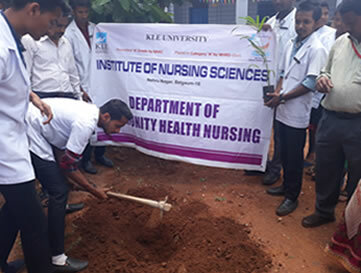 of Community Health Nursing celebrated World Environment Day on 5th June 2018. On this occasion, tree plantations were made (Vanamahotsava) at the premises of Govt. 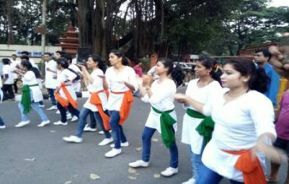 School, Kakati and Govt. 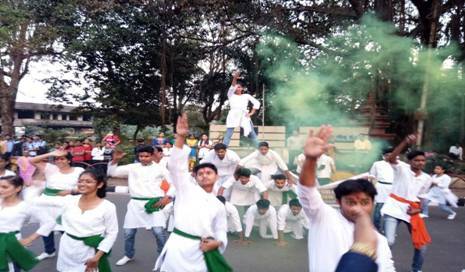 Deaf & Dumb School, Belagavi. Total 20 plantations were made. 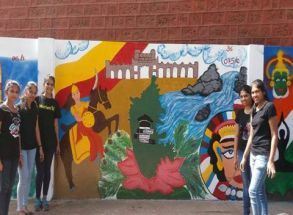 Along with this, Health Education programme on avoiding use of plastic was given by our students. During this event, School teachers from Govt. School, Faculty from Dept. 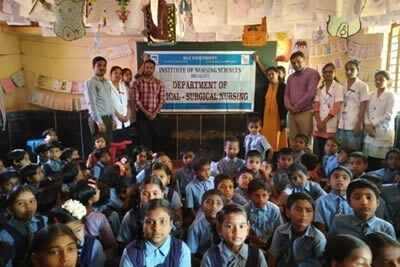 of Community Health Nursing, School children and children from Govt. 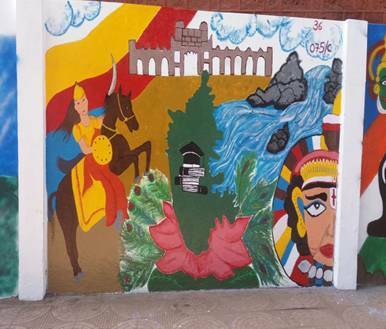 School actively participated in the event. 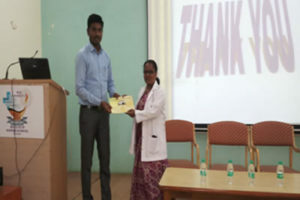 Department of Medical Surgical Nursing, KAHER Institute of Nursing Sciences, Belagavi Organized Guest Lecture on “Renal Transplantation ” on 21st May 2018. 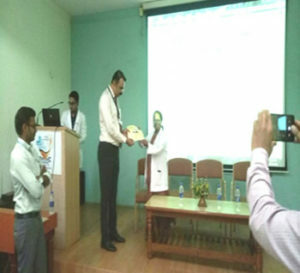 The guest speaker was Dr.. RajendraB Nerli ,Professor (HOD) Department of Urology JNMC, Belagavi. Guest speaker gave a lecture on indications, contraindications, Nurses responsibilities during Renal Transplantation and Importance of Renal Transplantation . M. Sc. Nursing, 2nd year GNM, 2nd year B. Sc. 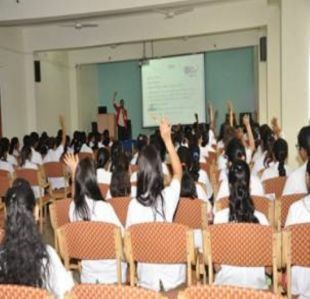 Nursing students and all the faculties of Medical Surgical Nursing department were present during the guest lecture. 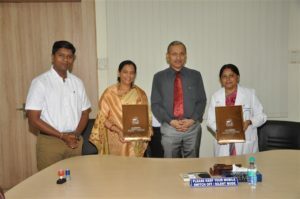 The memorandum of understanding (MoU) between KLE ACADEMY OF HIGHER EDUCATION AND RESEARCH (KAHER) Belagavi, Karnataka, India and CHITAWAN MEDICAL COLLEGE, SCHOOL OF NURSING, Chitwan, Nepal on 17th May 2018. The main aim of this MoU is to develop an on-going framework for student and staff elective placement and exchange program, Conducting colloquiums, exchange of academic/research information and related materials to facilitate joint publications by collaborating faculty members. 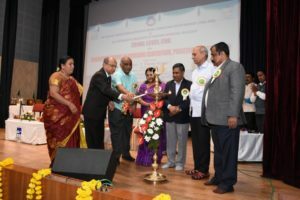 Dr. VivekSavaji Vice Chancellor, KAHER, Dr. V.D Patil, Registrar, KAHER, and Dr. Sudha Raddi, Dean, Faculty of Nursing, Principal, KAHER INS and Mrs.Mamata Sharma Nepune, Associate Professor, CMC School of Nursing and Mr.SiddeshwarAngadi, Vice principal, CMC School of Nursing, Nepal, were present from Nepal to sign the MoU. 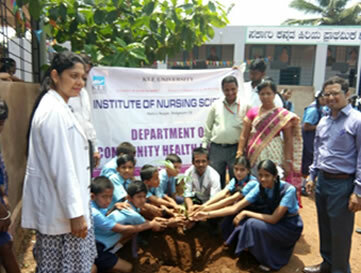 DEPARTMENT OF CHILD HEALTH NURSING, BELAGAVI. 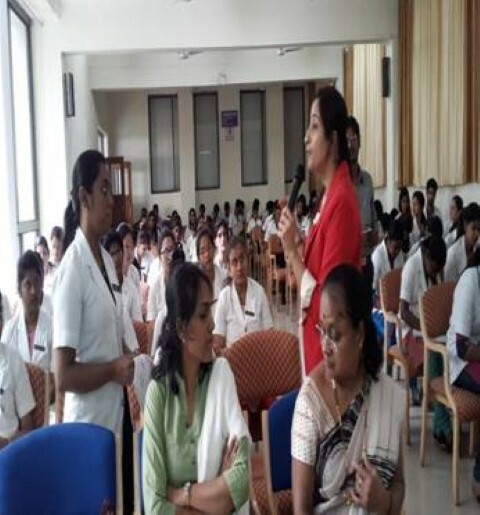 The Guest lecture was conducted on “Management Of High Risk Newborn” on 15th May 2018, by Department of Child Health Nursing, KAHER, Institute of Nursing Sciences, Belagavi. 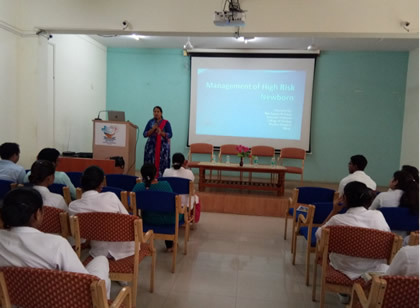 Mrs. Suman Pawar, Associate Professor, College of Nursing, Wanless Hospital Miraj, gave a comprehensive lecture on “Management of High Risk Newborn”. She elaborated on different types of High risk cases and their management and role of paediatric nurse, which is going to help for promotion of optimal health and development of the child. 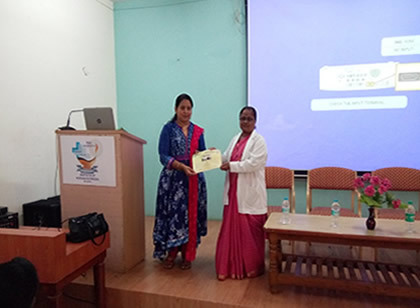 Prof (Mrs) Sumitra LA, HOD, Department of Child Health Nursing welcomed the guest speaker and vote of thanks was given by Mrs. Vaishali S.B , Senior tutor, dept. 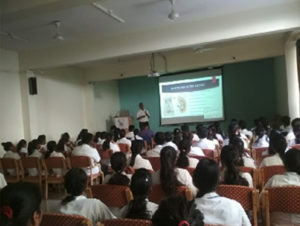 of Child Health Nursing.1st Year M.Sc (N), 2nd Year M.Sc (N), 3rd Year B.Sc (N)and 2nd Year GNM students and faculty of Child Health Nursing department attended the guest lecture. 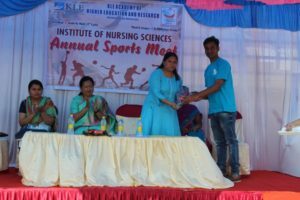 KAHER Institute of Nursing Sciences Belagavi and KLE’s Dr. Prabhakar Kore Hospital together celebrated International Nurses Day on 19th May 2018. 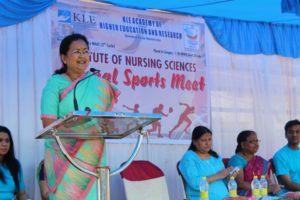 Prof (Dr) Sudha Raddi, Dean Faculty of Nursing Principal, KAHER Institute of Nursing Sciences, Belagavi unfolded the theme. “Nurses -A Voice to lead- Health is a human right” and welcomed the gathering. 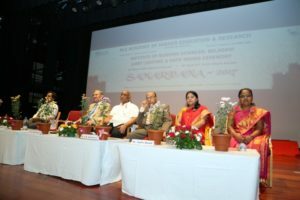 Prof Sumitra L.A. Vice Principal, KAHER Institute of Nursing Sciences, Belagavi, MrsSujathaSatish, Nursing superintendent, KLE Prabhakar Kore Charitable Hospital MrsShivaleela S, Nursing superintendent,& KLE Prabhakar Kore Hospital and MRC Belagavi and MrsMilkaMadhale were the guests for the event. 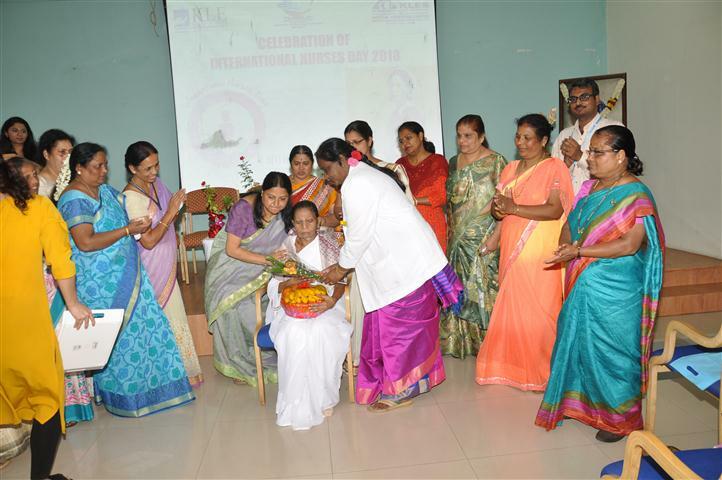 06 Nurses were felicitated for their relentless service in the field of nursing from college and hospital. 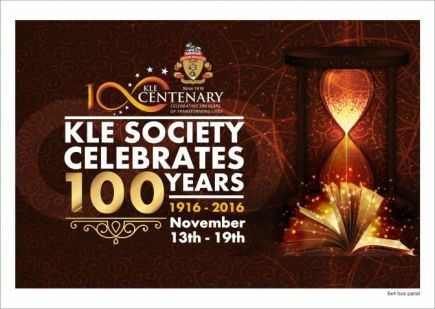 MrsGeeta Desai, KLE Prabhakar Kore Charitable Hospital proposed the vote of thanks. Total 160 Nurses participated in the program the whole program was coordinated by SNA team. Program ended with high tea. 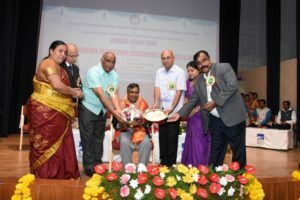 The trained nurses Association of India, Karnataka state Branch (TNAI KSB) and KLE Academy Of Higher Education and Research’s Institute of Nursing Sciences, Belagavi organized Zonal Level CNE on Current Reforms in Nursing Education, Practice & Research. 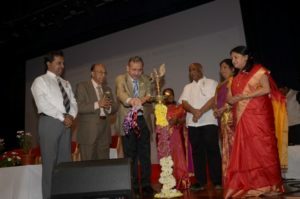 The chief guest of the function was Shri T. Dileep Kumar, Hon’ble President, Indian Nursing Council, New Delhi. 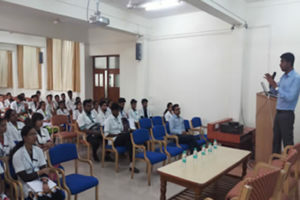 KLEUs Institute of Nursing Sciences, Belagavi organized guest lecture on “Higher Education in Foreign Universities” on 31st August 2016 at Seminar hall.Lecture was delivered by Mrs. Poonam Yarlagadda, CEO, Ascent Consulting Education Services Hyderabad. The topics covered were various Job opportunities for nursing and pharmacy and foreign universities that provide higher education like Austrelia, US etc. After the lecture, the forum was open for all, to clear their doubts. Department of Medical Surgical Nursing, KLE Academy Of Higher Education and Research’s Institute of Nursing Sciences, Belagavi Organized Health Awareness Programme and Poster Exhibition on “world heart day” in Rukmini Nagar Belagavi on 29th September 2016. Second Year GNM Nursing students exhibited the posters and educated the Rukmini Nagar public regarding heart disease ,sings & symptoms, preventive measures and treatment. 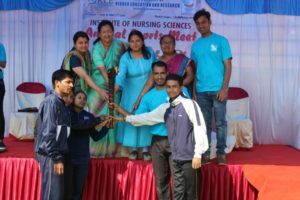 All the faculties of Medical Sirgical Nursing Department were present during the programme. 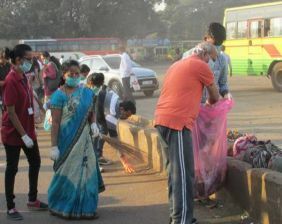 Rukmini Nagar public were benefited by the programme. 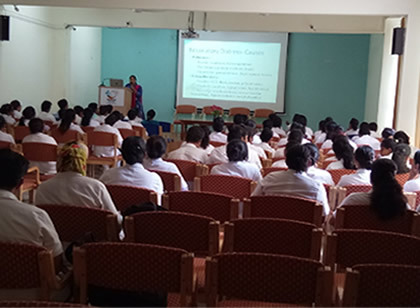 Department of Medical Surgical Nursing, KLE Academy Of Higher Education and Research’s Institute of Nursing Sciences, Belagavi organized Guest Lecture on “CABG, A Nursing Prospective” on 28th September 2016. 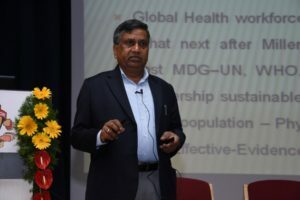 The guest speaker was Prof. Abhaykumar S. Gayakwad, Gulabrao Patil College of Nursing, Miraj, Maharashtra. 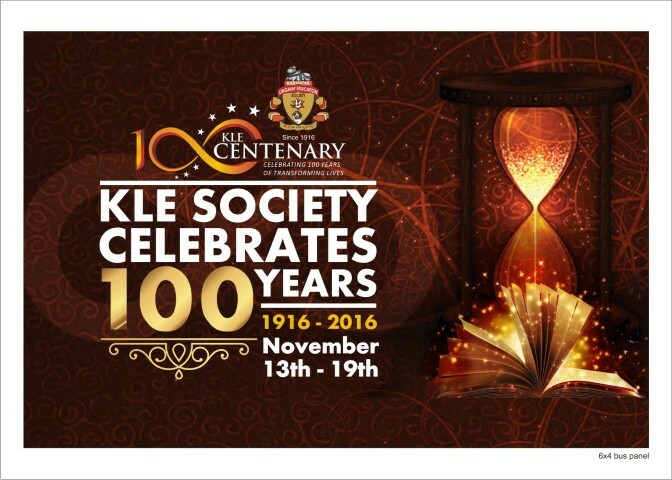 Second year GNM, 2nd year B. Sc. 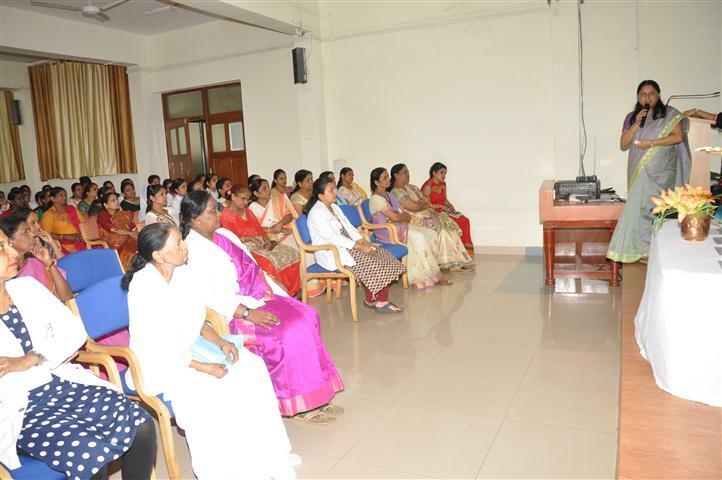 Nursing students and all the faculties of Medical Surgical Nursing department were present during the guest lecture. 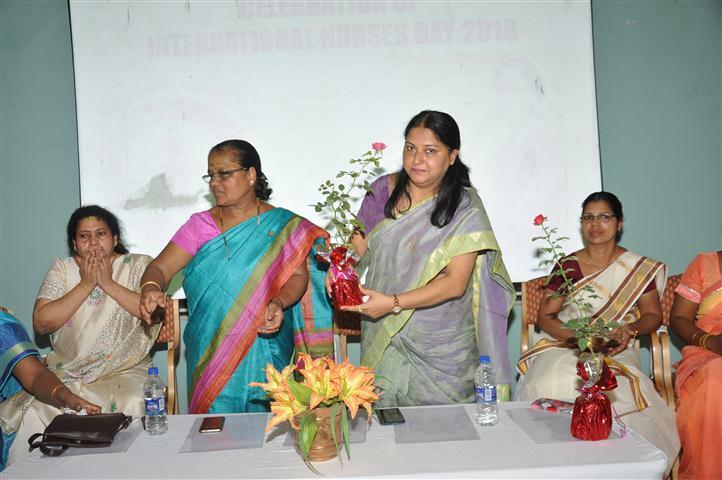 Department of Medical Surgical Nursing, KLE Academy Of Higher Education and Research’s Institute of Nursing Sciences, Belagavi Organized Guest Lecture on “World Sight Day” on 17th October 2016. The guest speaker was Dr. Joytsna Nandipati Consultant. 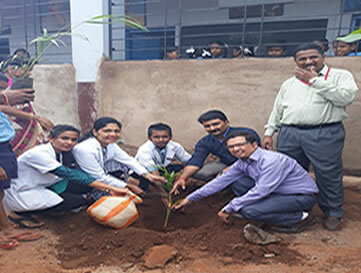 Dr. Joshi Hospital, Hubballi. Second year GNM, 3rd year B. Sc. Nursing students and all the faculties of Medical Surgical Nursing department were present during the guest lecture. Department of Medical Surgical Nursing, KLE Academy Of Higher Education and Research’s Institute of Nursing Sciences, Belagavi Organized Health Awareness Programme and Poster Exhibition on “Malaria” in Rukmini Nagar Belagavi on 21st October 2016. 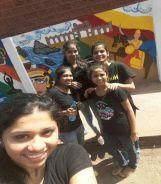 Nursing students exhibited the posters and educated the Rukmini Nagar public regarding Malaria disease, its sings & symptoms, preventive measures and treatment. 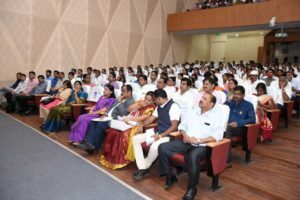 All the faculties of Medical Surgical Nursing Department were present during the programme. Around 150 number of people benefited by this programme.